If you accept the premise that there’s something wrong with the balance of power between politicians and media what do you do about it? This was what Lord Leveson asked former Prime Minister Tony Blair at the end of his lengthy and largely unrevelatory evidence. The answer is that there’s little you can do without instituting the kind of regulatory regime that governs broadcasting and compels TV and Radio journalists to achieve a reasonable proportion in their coverage of party politics. This is why Craig Oliver had such as go at the BBC’s Norman Smith in Downing Street. The exchange became infamous because it was caught on camera, but it is routine. That is because it works. The BBC and other broadcasters know that in the end they have to satisfy the politicians that they report fairly. Do you want your newspapers to have similar responsibilities? Whatever you think, their proprietors don’t. And they are the people who put the money in. In a free society it’s generally accepted they should be allowed to push their point of view. It can be argued that is what the punters want. Compare our press with other countries and it looks more partisan and often more petulant, aggressive, and disproportionate, even deceitful, destructive and dubious at times. But it excites people about politics and, in the case of pasty taxes and intelligence secrecy and MPs’ expenses, it can achieve healthy political results. The fact is that there is little Leveson can do to bring in reforms to curb the excesses in political coverage. Yes, he can set up a sensible independent watchdog with real teeth to curb the lies, bullying and invasions of privacy in ordinary people’s lives. But he can’t legislate to make newspapers less partisan and aggressive about politics. Leveson is having a lovely debate about politics and the media but it ain’t gonna change much, if anything. It is as much up to politicians as the regulators to reform that relationship. I repeat. Leveson could set up the new PCC tomorrow. The rest of this inquiry, compelling as it is for media analysts like me, is largely a waste of time. It increasingly feels like a work of history. Newspapers are declining, their culture is in retreat. Set up a new regulator and let’s get back to work. There’s quite a lot to argue with there. When the definition of freedom and censorship is similar to the definition of ‘freedom’ in which beggars are free to eat Oysters, then I suppose you’re right. But when the only journalism that can be resourced is that which provides arguments to support a narrow political perspective, we have censorship that is, in many ways, as pernicious as the cruder forms practised by various shades of totalitarianism. In particular, a democracy can’t function fairly if owning a newspaper gives someone any more influence than your next-door neighbour. We can dig into what that means and look to a more juridicial type of democracy for a solution, but at it’s simplest, it is intolerable that (in an industry where you make money by beating regulators rather than competitors) that owning a newspaper allows you to distort markets and effectively demand corporate welfare. 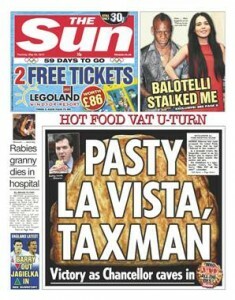 I’d also argue with your view that the MPs expenses / pasty tax climbdown are, in themselves, positive products. I suppose they’re positive in the sense that the provision of bread and circuses was at least a positive outcome from Roman demagoguery, but in both cases, they were sharp reminders – if they were needed – about who is in charge here. I’ve found Leveson very frustrating. It’s not addressed the ‘arithmetic of democracy’ at all and it should do. It’s the key issue and it’s going to be missed.